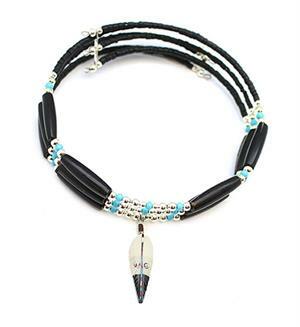 This memory wire choker has 3 strands of black heishi with black ox horn, silver plated and turquoise colored beads and a synthetic non-indian carved painted feather dangling in the middle. Width of necklace is about 1" wide. Strung by Navajo artisan Severn Blackmountain.